*APY=Annual Percentage Yield. Promotional offer effective 11/15/18 and subject to change or end at any time. Must be new money. 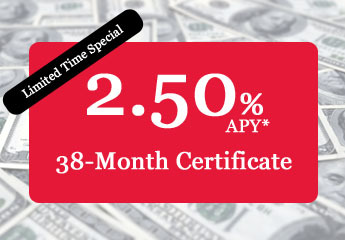 Offer not valid on IRA certificates. Minimum certificate purchase amount: $5,000. After maturity, certificate will automatically renew as a 36-month certificate at the prevailing rate, unless member indicates otherwise. Subject to penalty for early withdrawal. Penalty may reduce earnings on account. Federally Insured by NCUA.